We welcome children of all ages into our office and desire to make their visits as encouraging and educational as possible. We recommend that you have your child's teeth checked by age one or at the eruption of the first tooth and continue to schedule their appointments regularly for optimal oral health. Regular visits allow the dentist to become thoroughly acquainted with your child's oral needs and determine early on whether treatments such as orthodontics will be needed. 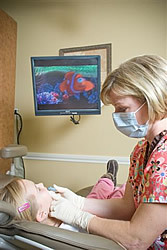 Our office staff will help you and your little ones learn to brush, floss, and have fun while at the dentist. Our office strongly recommends fluoride to all children who live in the Spokane area. 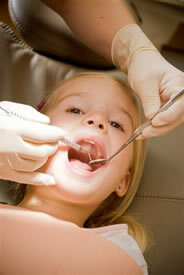 Spokane has one of the highest rates of tooth decay in the USA, a statistic we are working hard to change. Our exams include digital X-Rays (up to 60% less radiation), a thorough oral cancer screening, gum evaluation, examination by the doctor and a review of your health history. It is very important to bring a list of all your current medications if you have trouble remembering what you take. Also, patients who know that they need to pre-medicate with antibiotics should let us know ahead of time so your appointment goes as smoothly as possible. 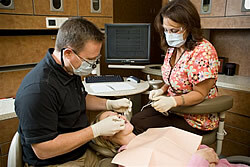 A professional dental cleaning will be performed by a Dental Hygienist. The hygienist will first clean the tartar from your teeth, which tends to collect at the gum line, using special tools to gently remove these deposits. Next the hygienist will polish your teeth with a soft rubber cup to buff away the plaque. Plaque is a sticky substance that turns hard with time and can cause gum disease and cavities if not removed regularly. Polishing your teeth removes stains and plaque leaving your teeth with that smooth feeling. Digital radiographs are the newest technique in X-Ray technology. 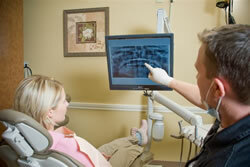 With digital radiographs, film is replaced with a flat electronic pad called a sensor. Up to 60% less radiation is required with this new technology. The X-Rays hit the sensor the same way they hit the film, but instead of developing the film in a dark room, the image is electronically sent to a computer where the image is displayed directly on the computer screen in a matter of seconds. The images can then be stored on the computer indefinitely for later use or printed out on photo paper. Signs of periodontal disease are: bleeding at the gum line, gum recession, bad breath, and the loosening of teeth. Our office provides a non-surgical approach to gum disease. For our patients who have slight gum irritation and small amounts of plaque and tartar, we generally recommend a regular cleaning. In many cases the amount of inflammation is severe and the bone around the teeth begins to diminish. In these cases the patient may require a series of deep cleanings that extend under the gums to remove the debris and control the bacteria. In certain cases, surgery may be indicated which may involve a referral to a periodontist. Persistent bad breath and/or bad taste. Periodontal disease is the number one cause of tooth loss. In many cases periodontal disease is not painful and quietly destroys the bone holding your teeth in place. We offer our patients the option to whiten their teeth before beginning any complex cosmetic treatment to optimize the effect of the finished procedure. Whiter and brighter teeth can make all the difference in your smile and self-confidence. Typically, porcelain veneers are made to fit over your anterior (front) teeth. These restorations look and feel natural and can help to correct minor crowding, color and enamel irregularities. Dental restorations (fillings) may last for many years before they need to be replaced. However, constant abrasion from chewing, grinding and clenching may cause a filling to wear, chip, crack, or even fall out. It is important to have regular dental examinations to keep track of your oral health and prevent a minor restoration failure from damaging the surrounding tooth structure. During your annual checkup your dentist can determine whether existing restorations are in good repair, or are in need of replacement. Replacing worn fillings in time prevents decay from corroding the tooth beyond repair. Crowns are placed when a tooth can no longer support a filling. In some cases extensive tooth decay around an existing filling may leave insufficient tooth structure once the decay is removed and your dentist may need to restore the tooth with a crown instead of a filling. Crowns can be made from several different materials depending on the situation: Porcelain/Ceramic, Gold, and Porcelain Fused to Metal crowns are all used in our practice. One of the newest and best options for tooth replacement when applicable, is an implant. Dental implants are small titanium posts or ?roots' that are surgically inserted into the bone in place of the missing teeth and allowed to heal. After the implant has sufficiently healed, a custom porcelain crown is fabricated to fit over the post for a natural, healthy looking smile. Dental implants are among the biggest breakthroughs in modern dentistry. With implants, missing teeth can be replaced as "stand alone" crowns, eliminating the need for bridges and, in some cases, even eliminating the need for partial dentures or even complete dentures! Used in tandem with complete dentures, implants provide a stable, secure fit and natural look that ultimately creates a confident smile. For patients who are missing most or all of their teeth, these appliances can restore your ability to smile and eat normally. We recommend that patients who wear a lower denture consider having two to three implants placed to help retain the denture more securely and comfortably. For some teeth that have infections or severe decay this procedure is necessary to cleanse the root of the tooth, removing the bacteria that cause inflammation and pain. For most people the mention of a root canal can cause anxiety do to the misconception that root canal therapy is an unavoidably painful procedure. However, root canal therapy is more often completed as a pain free procedure. After a root canal the tooth typically will require some sort of crown to protect the tooth from fracturing. From wisdom teeth to teeth that are damaged beyond repair, sometimes the only option is extraction. In most instances we can perform tooth extractions in our office but for patients who require sedation or more complex tooth removal we will refer you to a friendly oral surgeon whom we work with frequently. Following an extraction it is important to follow the after surgery instructions you are given. Smoking and physical activity are strongly discouraged for several days afterwards to prevent complications. If you feel that you are running a fever or have excessive swelling, please call our office ASAP day or night. Nitrous oxide (N2O) is simply a colorless, sweet-smelling, nonirritating gas which you can breathe during a stressful procedure. Discovered in 1772 Nitrous Oxide induces a pleasurable and relaxed feeling. Nitrous oxide is a very safe and effective way to counter anxiety. After five minutes or so of breathing in the gas, you should feel calm and warm feelings spreading throughout your body leaving you relaxed. Due to this relaxed state, people often get 'the giggles', hence the name laughing gas.